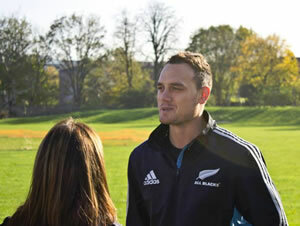 The All Blacks took advantage of the facilities at the Park Club today (15th November) to hold a training session prior to their showdown with England at Twickenham this Saturday. Tim Slater, Marketing Director of the Park Club said, "The past few weeks have been incredibly busy at our Clubs with exciting events including Oxjam, Spineathon Charity Challenge, Park Club Fireworks and it’s been great fun. But today was simply super cool! Members who were here just couldn’t believe the All Blacks were hanging out here. What a great day!" Last year, in the same fixture England won by their biggest ever margin of victory and that loss is the only one by the All Blacks in the last thirty three games. Victory tomorrow plus another win at the Aviva Stadium against the Irish will mean that the All Blacks will become the first professional international rugby union team to go through a full calendar year winning all their games. The game will also mark the hundredth cap of fly half Dan Carter who has recently returned from injury. The training event which was arranged in association with AIG was kept secret due to the likelihood of an intense level of press interest ahead of the game.